I’m up at the crack of dawn this morning in order to travel to Swindon for a meeting of the Astronomy Grants Panel of the Science and Technology Facilities Council. Three days in Swindon beckon. Anyways, while I’m thinking STFC stuff let me put my community service hat on and remind astronomers that the Astronomy Advisory Panel (yes, there is one) is consulting, and the deadline for folks to fill in the consultation questionnaire is tomorrow (Wednesday 5th September 2012). Please upload your input forthwith. 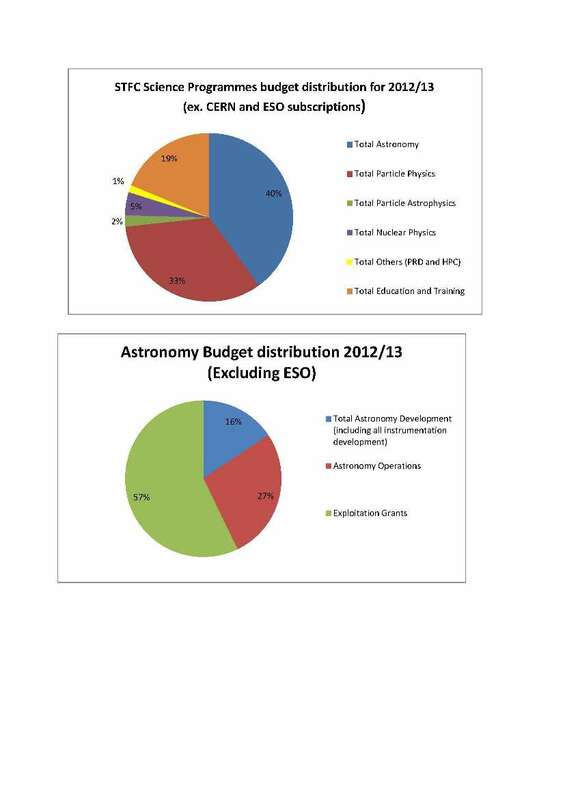 As a prompt, you might like to have a look at this figure that shows the breakdown of STFC expenditure generally, and specifically within the astronomy programme. Do these pie charts provide you with food for thought?